This week I have embarked into uncharted territory, not eating food! Om Cooking‘s Chef Ken Immer has created a three day juice fast for me. Ken sat down with me at the “Home of Om” his catering kitchen off of Remount Rd in North Charleston where he produces delicious things like his very popular “gRAWnola”. He spoke to me about everything from how our bodies metabolize food to how important it is to teach yourself will power. I left with a very heavy box of juice made of a special blend of mainly Kale juice. When it comes to food, I pretty much love it all! I do however acknowledge the health benefits of choosing one type of food over another. 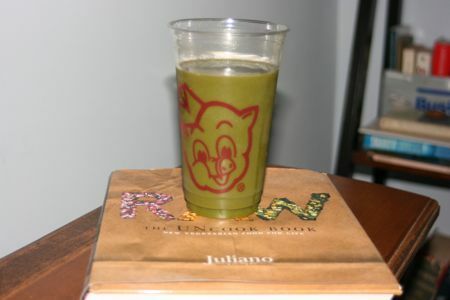 Last year I picked up a Raw Food Cookbook and fell in love. Mainly what I love about the Raw food is how quickly it erases the effect of too many super rich restaurant dinners. I also love that you can drink red wine. Most importantly the way it makes me feel! A couple of days of raw food only and I am extraordinarily energetic mentally and physically. The juice fast has been much easier than I expected. I pretty much drink this really hearty soup like juice and water all day accompanied by some supplements in pill form, also provided by Ken. Yesterday I drank juice at lunch while my client ate sweet potato cakes at Fuel. Last night I had some juice for dinner while my friend had barbecued chicken, mashed potatoes, mac and cheese and collard greens from Whole Foods in Mt. Pleasant. When I woke up this morning I expected to feel very hungry and deprived, but I feel great. I don’t think this will be my last Om Cooking juice fast.